Mai Chau is a beautiful valley populated by ethnic White Thai in Hoa Binh province, around 130km from Hanoi. The journey by car is approximately 3 hours and a scenic drive itself. Mai Chau draws huge crowd of travellers who are fascinated by its stunning nature and touched by warm hospitality of Thai people. It is a favorite destination for Vietnamese motorcycle adventurers. 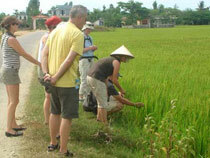 Following our guide, we start out in early morning fog of Hanoi to get to Mai Chau in search of new discoveries. Sceneries become more and more spectacular as we leave the plain and enter the mountainous Hoa Binh territory. Mai Chau welcomes us by the picturesque 12km Cun Pass curving around the mountain like a white silk strip to the sky. We are all overwhelmed by the land's rugged beauty with golden and white limestone peaks forming an impressive wall along the roads. The next stop is Thung Khe Pass, the finest place to capture a fantastic panorama of Mai Chau. Awesome! From Thung Khe pass, we continue our discovery by trekking through the forest to reach the valley. The trek is quite heavy as we go down slopes after slopes of rocky trails, some are very steep. Deep into the foresst we hear nothing but our footsteps and the soothing sound of a running stream. We are following it to the downstream, the Van village where ourThai ethnic hosts are waiting for us. We escape the forest around 5.pm and are surprised by the beauty and authenticity of Van village. A little away from the popular tourist hubs of Lac and Pom Koong villages, Van village is the perfect place for those who want to find a "refuge for the soul". A set of houses on stilts, tiny vegetable gardens, lush rice fields and the smiling people...all touch our heart. Our host, Mr. Ha Van Cuong has four daughters. The family earn a living mainly out of crops and livestock. He proudly tell us that he raise a herd of over 100 goats in the forests. Uncle Cuong's house was built 20 years ago. It is typical of Thai ethnic stilt house architecture: a large reception room decorated with numorous Certificates of Excellence for her children school study and a room next door reserved for family living and kitchen where they prepare our delicous meals. My greatest hope is that I can earn enough money to send my daughters to university studies in Hanoi and one day they will come back to Mai Chau to develop their homeland. The enthusiasm of Uncle Cuong and his family can be found in their happy smiles. They are proud to be the first homestay to accommodate foreigners in the village. Of course, they speak neither French nor English, but they will try to contact you via smiles and gestures ... Fantastic! It does get along! Activities you can join with Cuong's family are varied and albeit simple, they bring a lot of fun for travelers who find themselves in an "active discovery". •Or try your hand in brocade weaving, the White Thai ethnic people are excellent weavers. • Visit the market to buy ingredients and assist the family in preparing a typical Thai meal. If you are interested to experience Mai Chau off the beaten paths and meet the charming family of Uncle Cuong, just add his home to the hotel list.